Long before they can communicate with us they are copying movements and taking cues from those around them. But what if a child can't see us? What if they aren't able to identify their environments or even their own bodies? Their development, personal mobility and independence can be negatively affected. In England, Scotland and Wales there are services to help children with sight loss develop skills in different ways. The services are provided by law, but in Northern Ireland there is no such provision. However, rehabilitation services are offered to adults when they reach 18. Fiona Brown, from Guide Dogs NI, told the BBC that the services available fall "well short" of what children and babies here need. 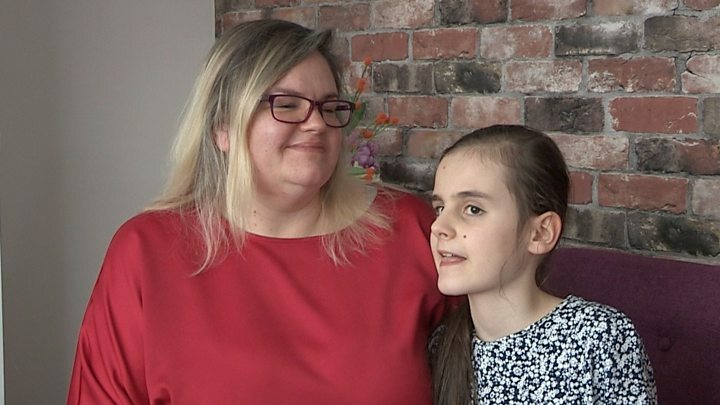 "Northern Ireland is the only part of the UK that doesn't have a statutory-funded service specifically for children who are blind and partially sighted," she says. "We were having really constructive conversations with politicians. "Unfortunately the stalemate that we have at Stormont has really ground things to a halt. "We'd had verbal commitments to look at how we would resolve these challenges, but really we are no further forward. "There are families who are falling between two stools right now and aren't getting the help they need through statutory-funded services." Sala Joy Storbeck moved to Northern Ireland three years ago, when she was just six. Her mother says it became apparent "quite quickly" that the family would not receive the same support as it had in England. She said it would have been a struggle for her daughter to develop any independence had she been in Northern Ireland in those early years. "We were taught how to arrange the furniture in our home, how to be more descriptive about our environments and how to feed Sala-Joy," she says. "Really simple things like learning how to walk and to feed yourself become complicated for children with vision impairment and for their parents." Sala-Joy now enjoys some support from Guide Dogs NI, which has helped her to learn how to make her own breakfast, use her cane to walk on a footpath and to cross a road, but her mum tells BBC News NI that she would like to see more consistent support provided to children by law. Image caption Caleb enjoys support from his habilitation officer, Emma. In a statement to BBC News NI, the Department of Health said it continues to work with Guide Dogs and others concerning services provided to children and young people with sight loss and a visual impairment. "This work includes the area of habilitation; the process aimed at helping those children and young people with significant sight loss attain, keep or improve their skills and functioning for daily living," it said. "In addition, health and social care staff support children, young people and their families through a range of areas to deliver child-centred approaches to address their underlying needs including visual impairments." The department also said that a health professional co-ordinator for children with sensory impairments will shortly be appointed, who will liaise closely with the various bodies and agencies providing support. Emma Locket, a habilitation specialist at Guide Dogs NI, visits children around Northern Ireland who suffer from sight loss and helps them meet developmental milestones through play. "From 0-4 is such a fundamental age for children, it's when they develop the most and they learn so much, so it's really important to have that early intervention," she says. "They're learning all the concepts like left and right, spatial awareness, about the body, so it's so important to start at that early age because if you miss those early stages, then they are playing catch up by the time similar services are offered to them at age 18 and it's so much more difficult. "They're just like a wee sponge at this age." Darren Carr, whose two-year-old son Caleb Williamson has sight loss in one of his eyes, says he wouldn't want to be without the service offered by Guide Dogs NI. He says he isn't aware of anything similar offered through healthcare providers. "Caleb's confidence has improved so much since he started working with Emma," he says. "He has really come out of his shell." Video What's it like to have a guide dog at school?